This article covers both cheap alternatives to gun safes, as well as inexpensive ways to increase the security of any gun safe. It will give you lots of ideas for how you can protect your guns. You may decide you don’t need a gun safe at all. Many families just want to keep their guns away from the children and smash-and-grab burglars. They assume anything is better than nothing and are looking for a cheap gun safe. In reality, gun safes are an expensive and sometimes unreliable way to accomplish that goal. Job Box Toolboxes start at around $300 new and make great Cheap Gun Safes. Buy a job site toolbox instead. Build a closet gun safe vault in a closet or pantry. Buy or build a hidden gun safe to hide your guns in plain sight. Improve the security of your home and reduce your fire risk. For example, a single wire tie can keep burglars from using a coat hanger to break into your garage in 6 seconds. Many measures to prevent burglars from targeting you are free. The most important thing you can do is choose a good location and bolt it down. Buy a used true safe instead. Hide your gun safe in a hollowed out refrigerator or fake wall. Build a closet around it to protect the weaker sides. Buy a gun safe without fireproofing and install a sprinkler head over it, or fireproof it yourself. Special order your gun safe to add steel only on sides you need it. Hide or lock up your tools so burglars can’t use your own tools against you (which they often do). You can even install pepper spray booby-traps to your gun safe! The only limit in many cases is your imagination. Here are over 100 ideas to get you started. Have an idea that I’ve missed? Leave a comment and let me know. Assess Your Risk and Desired Protection – the best way to save money on a gun safe is not to waste money on protection you don’t need. Cover Your Assets – no gun safe is 100% secure, so proper insurance is important. Layer Security Features – the key to security is multiple layers. 1. Avoid Being Targeted – some tricks gun thieves use to target owners and how to stop them. 2. Deterrence – simple things like changing when you run errands can deter thieves. 3. Break In Time – what really works to keep burglars from getting in your home? 4. Finding Your Valuables – get thieves to give up and leave before they find your good stuff. 5. Accessing Your Valuables – ways to make breaking into your guns as time-consuming and even painful as possible. 6. Getting Away – if they do find your good stuff, stop them from getting away with it. Protection from Flooding, Moisture, and Handling – gun safes can make some problems worse. Protection from Fire – reduce your fire risk on the cheap. This is the fourth article in the series What You Need to Know Before Buying a Gun Safe. The first way to save money protecting your guns is not to waste money buying protection that you don’t want or need. Before you do anything, it helps to size up the situation and evaluate what your threat level is. This article Assess Your Risk and Desired Protection will help you. Once you’ve considered the real risk of burglary, flood, and fire, and taken a look at insurance, you should have a better idea of how much additional protection you want and need. Maybe you don’t even need a gun safe, or can get away with a cheaper one! Your homeowner’s or renter’s insurance is your first line of defense against theft and fire. But insurance, and even police reports, are useless if you can’t prove what you owned. Documenting your valuables will also give you an idea how much insurance coverage you need. Some readers commented that they didn’t appreciate the importance of this until after a burglary happened. Catalog the make, model, specifications, and serial number of all of your guns and other big ticket valuables like lawnmowers, ATV’s, electronics, etc.. Take high resolution digital photographs of these valuables, including the serial numbers. I keep a separate digital photo folder just to hold insurance pictures, where I store more pictures when I buy something new. If you have an expensive amount of ammunition, document that too. While you’re at it, it’s not a bad idea to scan or copy important documents like car titles, birth certificate, passports, driver’s licenses, etc., as long as you store them securely or encrypt the data. Store multiple copies of this information, with at least one away from your home. You can put it at a family member’s house, at work, in a safe deposit box, or other location as long as it will be safe if there is a burglary, flood, or fire in your primary residence. For storage, you can burn the information to CDs/DVDs, copy it to a flash drive, or upload it to “cloud” file storage site like Google Drive (comes with Gmail account) or Dropbox. Some services are “free” and some paid or have paid options. “Free” online services have their drawbacks, discussed below. Put another copy of the insurance information on a USB Drive and store it in your bug-out bag or other emergency evacuation location. Add a recurring notification to the calendar of your email account to remind you every 6 to 12 months to update your list of valuables and remind you to take pictures of anything else you forgot to photograph when you bought it Every year or so, burn another CD/DVD, update the flash drives, and replace the off-site copy with the updated version. Sometimes burned CDs are not readable or have other problems. For this reason you might want to keep the last couple of CDs so you don’t lose all the information if one is bad. Another option is to keep the files on a computer with an encrypted cloud backup service like Carbonite running That way all of your files will be stored off site in case something happens to your residence. If you have multiple computers that you dock together periodically, you may be using File Sync software (Microsoft’s free SyncToy is one) to copy files between them, which will also create backups. When I realized out my guns were under-insured, I called my insurance and added an Additional Firearms Coverage Rider to increase the limit, as well as the Replacement Cost Option. Both cost me less than $80/year — much cheaper than a gun safe. The cost to insure your collection will vary, and you may have to get separate coverage. It’s well worth it. An expensive gun safe may fail and get broken into, flooded, or burned up. Even if this happens, proper insurance will cover the both the contents and the safe (unless it’s TEOTWAWKI). Get any guns, jewelry, or other specific items appraised as required by your insurance company, or find a company which doesn’t require appraisal. If your collection is particularly valuable or hard to replace, your insurance company may require you store them in a true safe. Or, they might give a premium discount for a true safe, so it doesn’t hurt to ask before you buy one. Note that many of the home security improvements below may reduce your homeowner’s insurance rates and be tax deductible. Check with your homeowners insurance about discounts they offer. After implementing the improvements, make sure to contact your insurance company again to get your credit. If you are a NRA member, it used to come with $2,500 of free gun insurance that had to be activated. It looks like that benefit has gone away. If it returns, I’ll link to it here again. Layering security is critical because a security system with only one layer is useless. Picture a monitored alarm system on a house with no doors or windows. Or, a stocked gun safe in a front lawn by a busy street — how long would it last there? A gun safe is only one layer of security, and it’s probably the most expensive part. Want to save money on a gun safe and get great protection? Improve the other layers of your security system first. Here are some money-saving ways to protect your guns. The cost of these “money-saving” tips ranges from free to hundreds of dollars or more. Remember gun safes are very expensive, so even a tip that costs a couple hundred dollars may allow you to buy a $1000 cheaper safe. A hidden homemade vault which costs $2,000 to build is a bargain if it offers 10X the protection of a shiny $5,000 RSC gun safe. If you’re concerned about protecting your guns, implement as many of these tips as possible. No security device is 100% effective. Given the right skills, equipment, and enough time anything can be broken into. Once you’ve Covered Your Assets, the first layer is avoidance and prevention. If prevention fails, the key to security is putting time on your side. Make your home as time-consuming, annoying, and painful for the burglars as possible. Avoid Being Targeted– you can make your home very secure, but if someone wants to get in badly enough they will find a way. If you can avoid being targeted specifically, the risk of being hit by an experienced criminal is reduced. Deterrence – the next step is to deter thieves from targeting your home. Finding Your Valuables – most burglaries last between 8 and 12 minutes. If a thief thinks he has found all of your goodies within that time, he will probably leave. If he sees signs that there may be more to find (like a gun safe), or knows beforehand about particular items that he hasn’t found yet, he may stick around longer. Accessing Your Valuables – Once thieves start to attack your security container or safe, it needs to make breaking it open as difficult, time consuming, and attention-attracting as possible. If your valuables are not locked, than this step is as simple as grabbing them. Getting Away– Even if burglars access your valuables, they still have to get away with them to safety without getting caught. The key to security is time. Your goal is to force a thief to waste as much time as possible. From the moment a burglary starts, the longer it takes, the less willing they will be to continue. How much time will be varies considerably. It may be minutes if they know that you’re polishing your AR-10 in the next room, or days if they know you’re on vacation on another continent for the rest of the week. A number of gun safes have been attacked for hours while the owners were away on vacation. Your name is very public. Most people who you meet know it, especially if you’re in the construction trades or otherwise work for yourself under your own name. Your home address does not need to be public though. Un-listing your number and address in the phone book is one of the easiest steps to make your address a little harder to find. Landlines are more and more uncommon these days, but this is appropriate for any directory. Don’t put your family name on your mailbox or home. Don’t use your full name in any directories or outgoing voice mail message. If you have to give your name, use your first initial and last name. One of the easiest ways of gun thieves to track you down is to type your name in a search engine. Type your own name in Google and other search engines (for example, Leroy Gibbs) and see what comes up. Also try your name plus city (for example, Leroy Gibbs Stillwater PA), and your full name (for example, Leroy Jethrow Gibbs). Often, each way will bring up different results. You may be surprised what you find. Say a thief is driving through your neighborhood and sees mail overflowing your mailbox. He walks by and reads a name off of your wife’s cooking magazine and pulls out his phone. Typing her name in Google brings up her Facebook profile. Her new profile picture with the family was just posted yesterday from your vacation in Mexico “first day in paradise!!! :-)” The next day he comes back with his friends and cleans you out. This is unfortunately more common than you may think. Check your Security settings on social media and especially Facebook. You should disable indexing your personal social media profiles by search engines. This should prevent an online search of your Facebook profile name from bringing up your profile. At a minimum, set your profile so that only Friends can see your pictures, posts, and information. Check the online profiles of you and your children to make sure they don’t list private information. Facebook, Google+, and online forums profiles are some of the places where your information may be made public. Your address/city information is most applicable to protecting your house and your guns. Your birth date, phone number, and other information may be accidentally made public as well. Your full birthday with year is a key piece of data used by identity thieves. The true year of your birth or age should not be posted online. This is another reason to restrict visibility of profile posts to friends only, to hide the “Happy 30th!” posts on your timeline. It’s more secure to avoid using your surname in Facebook, especially together with your first name. For example if your name is Willie Jess Robertson, a Facebook name of “Willie Robertson” makes it very easy for someone to find your profile in a Facebook search, and any information you have made public there. If you instead use any Facebook name that doesn’t include Robertson like “Willie Jess“, “Willie Sr.“, “Redneckcoleptic“, etc. it will be harder for a stranger to find your info. It should be mentioned that “free” social media services are not really compatible with privacy, regarless of the security settings. The simple reason is that on any “free” internet service like Facebook, since you are not paying them, you are not their customer. Instead, your personal information and “your eyeballs” are the product they are selling to their actual customers, the ones that pay them. Several high-profile tech celebrities have stopped using these services for this very reason. Food for thought, amongst other criticisms of these services which aren’t relevant to gun security. Hide your identity on gun forums and anywhere else where your presence or membership reveals you as a gun owner. These sites permit anonymity for a reason. Many of these forums link to photo sharing accounts like Imagur or Photobucket. Make sure your account on that site is also anonymous, and make it private if the information could be used to identify you. In your online profiles, you can also use misdirection to confuse thieves. If you must give a city, state, and/or other personal information, make it up. You can choose another town that has no connection to your name and use that, perhaps where your favorite coworker or Army buddy was from. This will be easy to remember and confuse someone trying to find you. With a mailbox like this, I’d wager there’s guns in this house. Your address is shared with a large number of groups and businesses. Some common examples are clubs, doctor’s offices, surveys, online petitions, children’s sports teams, online shopping, magazine subscriptions, etc.. Ideally, you want as few people as possible know your address where all your valuables are. Post office (PO) boxes are relatively cheap and a great alternative to giving out your address. If you move a lot, your mailing address doesn’t have to. Now that more and more bills are handled online, there’s less need to get your personal mail every day. The US Post Office offers a street addressing feature, so that your mail and packages can be sent to a real street address, not just “PO Box 1234”. Many private local shipping and printing companies offer this service as well, and cheaper. 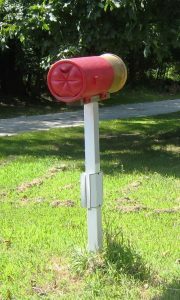 If you want to save money you could share a post office box with relatives or friends. For those of you with their own businesses with physical locations, you can send your home mail there since you’re usually there when it comes anyway. Without spending anything you can use a relative’s address. If your mother comes over every week or two to look after your children, you can send your mail there and have her bring it over. Of course using her address so that your house isn’t targeted means that her house may be targeted instead. But if she lives far enough away that a thief isn’t likely to go there, lives in a low crime area, or has a more secure home than yours, this is a cheap option. Another option is to use an online mail forwarding and scanning service. These services serve different customers from small businesses, to travelers and RVers, to people in apartments that can’t sign for packages. With the largest companies, you can pick an address in many states and have your mail sent there, where it will be forwarded to another address and/or scanned and e-mailed to you. Earth Class Mail is the biggest with addresses in sixteen states, but has gotten very expensive. Traveling Mailbox is much cheaper with addresses in twelve states. There are a dozen or so other notable services which only have one state address. Many local shipping stores now offer mailbox and forwarding services, so find one in a town convenient to you and ask them about it. An advantage of using shipping stores is that their addresses are usually commercial rather than residential. Commercial addresses are often charged cheaper shipping rates for large packages, or those requiring signatures. that address is showing up as a mail service, what’s your home address? Actually it is, it’s a precaution I took after I had my identity stolen. (true story) Could I provide a separate mailing and residence address? In most cases you will be able to provide separate addresses, even for home utilities. Banks may require you to go into a branch to do so. Doctors offices seem willing to change your address to Pluto as long as the bill gets paid where they send it. It does take a little work to get everything set up, so choose your company well. If you’ve served, OPSEC will be familiar to you. I know it goes without saying, but please keep this between you and me. The fewer people that know about it, the less likely someone will break in to get it. The less that other people know about your gun safe and other personal security measures, the less likely a burglar will come prepared to deal with them. That means they will be stuck looking for tools in your house to do the job, which is something you can take care of ahead of time. When sharing photos of your collection online, make sure to use anonymous accounts that can’t be linked back to you. Don’t brag about your collection, or invite people you don’t know well in to show them off. Even friends and family members can mean well, but from time to time have a few too many to drink and start talking about everyone’s business but their own. 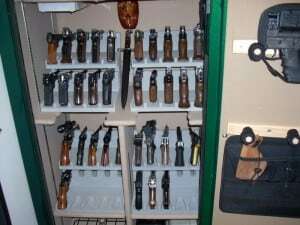 Many people on gun forums post pictures of their collection or their safe fully stocked up. Make sure if you’re going to do this that your personal information is concealed. I would venture a guess that in much of the country, someone who has a pro-2A or Gadsden Flag sticker on their vehicle owns at least a handgun, a shotgun, and a rifle. Hunting stickers may also identify a vehicle owner as a gun owner. In some areas of the country, the revelation that “Bill has a gun sticker on his truck” would be as shocking as “Bill drinks coffee.” The Virginia DMV even offers Gadsden Flag license plates, which are relatively common. So, how much this is a concern for you probably will have something to do with where you live. The visibility of 2A, political, and hunting stickers is the whole point, to draw attention to support for various freedoms. However, these stickers are visible to all manner of people all day while you’re at work, in a store, parked at a friend’s house, or in your own driveway. In your driveway, if a sticker is visible from the road, it may be visible from anywhere in the world in Google StreetView or other panoramic street photographs. It’s likely that some people you wouldn’t like to discuss your guns with will see one of these stickers. Unfortunately this also applies for any sort of affiliation that might reveal that you’re the owner of something worth stealing. Someone who breaks into your car after seeing a 2A sticker, will likely find your home address on your registration in the glove box. Now they know that you own guns, and where they can probably find them. Or, they can wait for you to come back to your truck, size you up, and then follow you home to get your address. The rhetoric from anti-2A individuals can be extreme at times. Based on these comments, stickers may also make you a target for vandalism in some parts of the country. If these issues concern you, it’s not a bad idea to keep your political activism targeted towards your grassroots organizations and your representatives, and refrain from putting stickers on your vehicles. For those in severely anti-gun states, this has an additional benefit of not giving the police any possible (unconstitutional) gun-related probable cause to search your car or truck. If you live in a state like this, you’ll understand. Around election time, political yard signs go up everywhere. Putting a pro-gun sign in front of your home is a great statement, but also advertises your gun ownership to everyone who drives by. Instead, put your signs up in a place that doesn’t reveal your location. I put my signs up in a nearby empty lot owned by an acquaintance that lives out of state. It’s on a busier street anyway. One or more children in that class may turn out to be criminals in a few years, and their parents already may be. 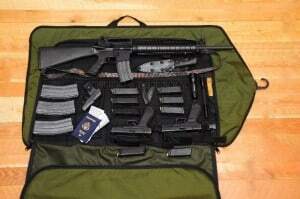 The more inconspicuous your gun cases and range equipment are, and the fewer people that see them, the better. Keep your guns out of sight when you loading weapons into your vehicle. Skinner Sights HTF Tactical Garment Bag allows you to discretely head to the range without being seen loading your trunk with gun cases. Most gun owners like to take a large portion of their collection to the range. This is pretty obvious to anyone that sees you loading a series of gun cases and ammo boxes into your truck. A passerby may only see you load one case. However, people sitting on their porch or mowing their lawn will see you making many trips back and forth. You may only have a couple .22’s, a bolt-action rifle, and a few cheap shotguns in those cases. But as far as the observers know, you just loaded up an arsenal. Put your gun or gun cases in cardboard boxes, guitar cases, golf bags, toolboxes, backpacks, or otherwise disguise them when you load your truck or car. You probably have these collecting dust in your attic anyway. Blackhawk makes a series of “diversion” carry bags specifically designed for transporting both handguns and long guns. These bags are made to look like a workout bag, courier bag, backpack, rucksack, sling, or other everyday packs. So if you’re in the market for a new range bag, think about getting one that looks like a gym bag. I remember one pistol shooting event when one of the Range Safety Officers brought his suppressed Glock. I’ve forgotten hundreds of people that have attended those events but I remember him because it was the first time I heard a suppressed pistol shoot (it’s not that quiet). The same goes for the wheel-gun guy with the modified 9 mm rounds loaded so light the bullets barely came out of the barrel. People are more likely to notice and talk about non-typical, unusual, or high-end guns and accessories. The fewer people that come in your home, the better protected your guns will be. That’s less people to see a gun safe, or other indications that you’re a gun owner like framed 50’s Winchester posters. If you have a plumber coming in to do some work, you might take those frames down and keep him out of rooms where he can see your gun safe. Instead of having a new mattress delivered, have them drop it off at the front door and bring them the old one. Install a new TV yourself instead of having some potential flunkie from a big box store drop it off. Check the references of any house cleaners or other people you hire to come in your home, especially if they have a set of your keys. Professional thieves may come to your door pretending to be window salesman or local contractors to case out your home. Don’t let anyone in before they show their credentials. If you don’t feel good about it for any reason, don’t let them in. I’ve found my gut instinct is almost never wrong. If anyone comes to your door because their car broke down, keep the door shut and offer to call for help yourself instead of giving them the phone. Delivery of gun safes is a perfect example of this point. After delivering a gun safe, the delivery guys will know what’s inside your house, that you have a gun safe, where the gun safe is, and what brand and model it is. 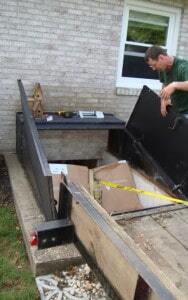 They may also have removed or replaced a damaged gun safe of the same brand, and know how it was defeated. Having a guy with a questionable past who just started working at a big box store last week install a gun safe isn’t the best idea. How do you know he doesn’t have some sort of criminal background? How do you know he won’t tell everybody at his dope spot or card game about the safe he brought into your house? Am I being paranoid? This retired cop noticed jailhouse tats on the guys delivering a gun safe, and decided to open his own store and hire veterans. Real safe dealers have experienced and reasonably paid delivery guys doing the job for a living. Most do very high end safe and vault installations too, so your gun safe is relatively small potatoes. They also have better installation equipment and are less likely to damage your floors and your house installing it. They should use unmarked trucks that don’t advertise to all your neighbors that you just got a safe. If the gun safe is under 500 lbs and you have some strong friends experienced at moving heavy things, install it yourself as inconspicuously as possible. You and your hunting or shooting buddies can all take turns installing each other’s gun safes. That way no one outside your group of friends knows what you have and where it is. 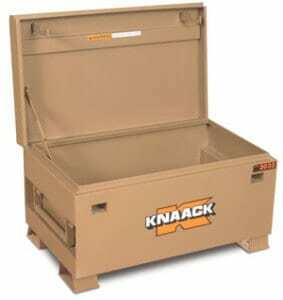 Modular or take-down safes break down into parts that individually don’t weigh more than a couple hundred pounds. As far as your neighbors know, you just bought some Ikea furniture. When getting into your gun safe, make sure to block others from seeing your combination. You can cover the dial or keypad with your hand, or make a habit of blocking others from seeing it with your body. If you have a lock with a user-changeable combination, make sure to change it from time to time. Also, change it preemptively if you catch one of your children trying to watch you type it in. Changing combinations is especially important on electronic locks, which may develop grime patterns which reveal the keys you use or narrow down your combination. Unrated electronic locks can develop wear pattern on the keys. To reduce the likelihood of creating a wear pattern, it’s better if your combination doesn’t repeat the same number twice. If your keypad starts to show wear, use all different numbers when you change your combination. Make sure you don’t forget your new combination. This is one of the most common problems with electronic locks. People often forget their combination right after changing it. Higher end electronic locks have a number of features which can be used to your advantage and convenience. Make sure to read the manual so you know all of the capabilities of your lock. 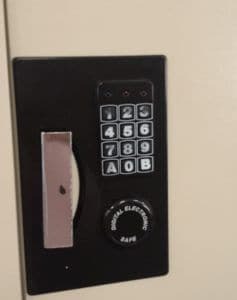 The most common feature is a wrong combination penalty lock out which will lock out the keypad for a certain number of minutes if a wrong combination is entered a certain number of times. You may be able to configure this option for fewer attempts, which makes it more secure. Or you could increase the number of attempts for home defense in situations when you fumble typing in the code under pressure. Some electronic locks come with the ability to program multiple combinations. If this is the case, there is a huge range of uses for this feature. You can program a backup emergency combination to use if you forget your primary combination. You could also program different combinations for different people. That way, if you later want to deny a certain person access, you can just erase their combination without having to give everyone else a new combination. On some locks you can program a separate “duress” combination which is connected to your monitored burglar alarm. If you someone forces you to open your gun safe, you can type in this code, setting off a silent alarm. Gun safes with electronic locks generally re-lock automatically when the door handle is locked. Gun safes with mechanical locks do not. If you don’t turn the dial, the door can be opened right back up without putting in the combination again. Make a habit of turning your lock dial at least one spin after shutting the door. “Flicking” the dial may wear out the lock (and void your warranty), so make sure you turn it instead.